One of my New Year's Resolutions for this blog is to get to Luzerne County more often and extend my review footprint southward to service more of NEPA. In order to do so, I thought it prudent to start at the norther end of the county and start working southward. 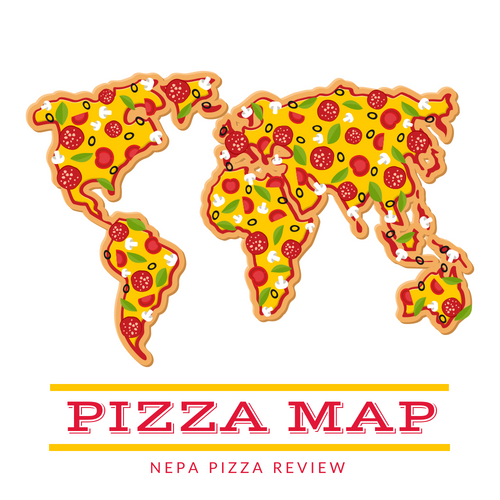 I've had some good luck in the Pittston/Exeter/Wyoming area in 2012, but I don't know of that many more places besides the ones which the readers have suggested to me, so I enlisted the proverbial dream team to perform a pizza review. First, I selected a hardened pizza review veteran who hails from Lackawanna County, specializes in Scranton-based pizza firms, and has been on quite a few pizza reviews with me in the past. To get some more local knowledge and get our ears to the ground, we teamed up with our upstart friend from Luzerne county to point us in the right direction. In this case, the direction was to Luigi's in Exeter. Believe me, we needed the navigator with my sense of direction and the strange road layout next to the river! Luigi's is a small pizza shop on Wyoming Avenue. We entered and found the dining room to be comfortable and had a giant television for us to watch while dining. I think there was also a bar on the other side of the building. 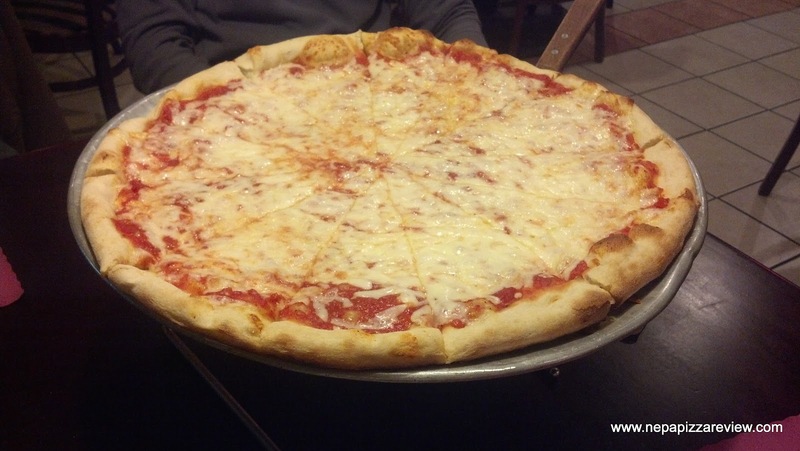 The three of us had a large appetite, so we elected to get 2 pizzas - the extra large round, and the old forge style. 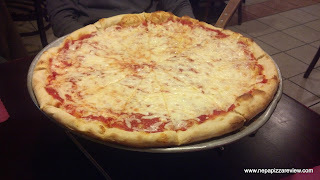 First up, we tried the thin crust New York pie. The pizza was fairly well made with plenty of sauce and cheese, although I would have preferred if the cheese was spread a little more evenly to the edges. The crust was a bit undercooked both to the eye and to the taste buds. The crust ended up being slightly doughy, which I didn't care for, but my Lackawanna buddy appreciated. I felt the sauce was "bone stock" meaning it tasted like it was fresh out of a supermarket number ten can. My Luzerne buddy mentioned that he didn't think it was too bad, so we had some differing opinions here. The cheese was also quite standard and lacked flavor and texture, but it really wasn't bad. We did debate the merits of certain components of the pizza, but overall the consensus was that we were not overly impressed. On to the "Old Forge Pizza" which I quickly disqualified from being called an old forge because it was really just a rectangular Sicilian. Don't get me wrong, being miscategorized does not mean it was bad! The crust was too thick and too dense to be considered an old forge, but as a Sicilian crust it had very nice bread-like qualities and was quite tasty. The sauce was the same sauce as on the New York Style pizza, which was not precooked in a pot before being put on the pizza. 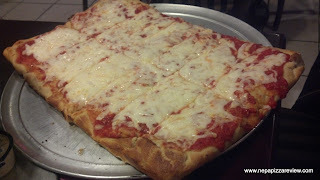 This also is indicative of a Sicilian pie, as old forge sauce is typically precooked. The sauce did taste better on the "old forge" tray because some Parmesan cheese was added. The cheese was also the same as on the New York pie, and was presumably a mozzarella or similar cheese, not an American cheese like many Old Forge pies. In any event, we did like the "Old Forge" pizza better than the New York style pizza as there was a little more flavor and it was cooked and prepared better. Overall I would say that Luigi's makes an average to above average pizza, and it is certainly worth a shot to grab a tray or two because it is a superior value.